Class of 2018 Master of Science in Nursing students process onto Alumni Lawn for the university’s overall Commencement ceremonies. Photo by Susan Urmy. 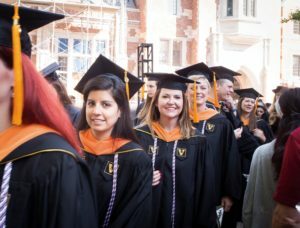 May’s Commencement marked a milestone for the Vanderbilt University School of Nursing when it awarded 73 Doctor of Nursing Practice (DNP) degrees, the greatest number since the program began in 2008. The school also awarded the Master of Science in Nursing (MSN) degree to 326 graduates during the investiture ceremonies on Branscomb Quadrangle. An additional six nursing students received their PhD in Nursing Science degrees in separate ceremonies held by the Graduate School. VUSN Dean Linda D. Norman, DSN, FAAN, told the assembled graduates that when she looked at them, she saw excellence and the bright, dedicated future of health care. Because VUSN students finish their programs at different times of the year, some graduates have already begun those journeys. This year’s investiture ceremonies honored those who completed their educations in August 2017, December 2017 and May 2018. This entry was posted on Thursday, October 4th, 2018 at 2:52 pm	and is filed under Departments, Fall 2018, Issue, News Around the School, Vanderbilt Nurse News. You can follow any responses to this entry through the RSS 2.0 feed. Both comments and pings are currently closed.